Clarion Builds BMW 2002 Custom K&N Air Filter Design and Installation Written by Jeremy Templeman, Brand News Writer / Reporter at K&N Engineering, Inc. When Clarion Builds delivered the 1974 BMW 2002 to K&N Air Filters headquarters in Riverside, California the ‘O2 lacked air filtration. 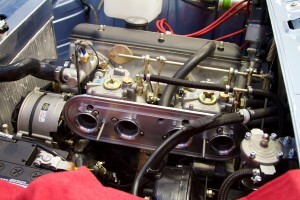 As one of the many performance upgrades for the Clarion Builds 1974 BMW 2002 a dual side draft Weber carburetor system from Ireland Engineering was installed. This aftermarket dual carburetor system made it necessary for Clarion Builds partner K&N Engineering, Inc. to design a one-off custom billet aluminum air cleaner assembly. At the time of delivery to K&N, the CB 2002 had four stainless steel velocity stacks bolted to the dual two-barrel side draft Weber carburetors. Running nothing but velocity stacks is good for unrestricted airflow, however they do nothing to prevent the engine from ingesting debris which can lead to carburetion issues or engine damage. There are many readily available air cleaner assemblies for Weber carbs; even from K&N. However, space under the hood of the CB 2002 was extremely limited by car’s battery, vacuum brake booster, and oil dipstick locations. K&N’s air intake system development department looked under the hood of the Clarion Builds 1974 BMW 2002 and decided a one-off custom air cleaner was the only way to provide the car’s engine with enough superior airflow without sacrificing superior performance that K&N is known for. In just a matter of days the custom air cleaner assembly, built specifically for the Clarion Builds BMW 2002 project, went from the concept phase, to design, build and finally assembly. K&N Air Filters keeps product manufacturing in-house at its Riverside, California facility. This gives K&N the ability to control quality and ensure efficient lead times. K&N’s on-site capabilities, such as the MAG Fadal VMC 4020FX machine which carved the Clarion Builds BMW 2002 air cleaner assembly out of solid aluminum block, allowed the Clarion Builds BMW 2002 one-off air cleaner to be created in a fraction of the time needed if any phases of the project had to be outsourced. K&N Air Intake System designers took measurements and a rather unique oval K&N high-flow air filter, was designed using SolidWorks and assembled in-house to tie both carburetors into a single low-profile air filter assembly. Further measurements were taken and the K&N team drafted a custom machined air filter base plate incorporating new spun aluminum velocity stacks. A custom air filter top plate was designed to mate to the new backing plate with as little hardware as possible for an uncluttered look. The SolidWorks files were sent to K&N’s on-site machine shop for programming into a format the CNC machines can understand. Factory aesthetics of the Clarion Builds BMW 2002 were taken into consideration during the design phase of the air cleaner assembly. It was decided that the air filter base plate would retain a raw brushed aluminum look to match the engine’s bare aluminum cylinder head, while the air filter top plate would be powder coated in a textured black finish to match the BMW 2002 valve cover. After being powder coated in-house, the air cleaner top plate went back to K&N’s machine shop. A pocket fixture was created to allow K&N to engrave stripes, using a 1/16 ball endmill, into the top plate’s surface to match the BMW valve cover design and the use of a period correct vintage K&N Air filters logo made this air cleaner a functional piece of art. About K&N: K&N Engineering is the world’s leading manufacturer of washable performance air filters and air intake systems. The K&N World headquarters, main manufacturing facilities and primary distribution center is based in Riverside, California. K&N is a world class filtration company selling air filters, oil filters, and air intake systems in over 30 countries with more than 5,000 products designed for cars, trucks, motorcycles, and industrial applications. From the K&N Million Mile Limited Warranty to the K&N Consumer Protection Pledge, K&N stands behind its products and its consumers. The distinctive K&N logo has represented performance for more than 45 years.